Sarah Bettey Photography: Dahlias for Days! 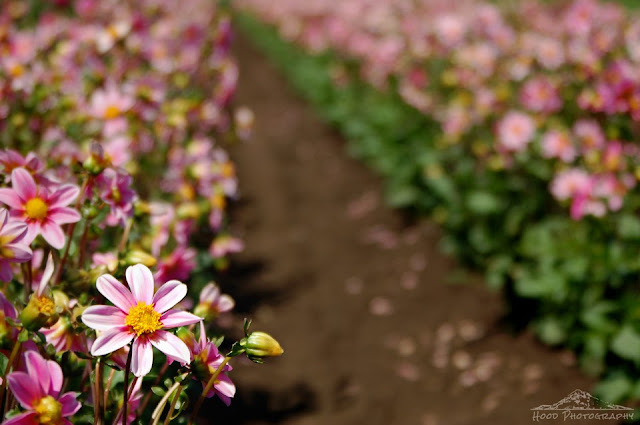 This past Sunday I traveled to the small town of Canby, OR and visited the Swan Island Dahlia Farm. I had never been before. It is amazing! The rows and rows of gorgeous dahlias are an awesome sight. There are so many varieties! There is a big dahlia festival which starts in two weeks or so, but I wanted to go early to beat the crowds, and I am glad that I did because I practically had the fields to myself. Ah! One of my favourite flowers! Delightful! What a sight! Love the DOF in this shot! You certainly find plenty to photograph in and around Oregon. So pretty. I love the vast variety of Dahlias. How fun to have the fields all to yourself. There was a wonderful ice cream place called Dahlias several years ago, unfortunately DEFUNCT. You took a beautiful photo of an elegant and yet strong flower! Must be quite a heavenly experience to wander rows of flowers. Your photo is a very pretty "taste" of this world. Sounds awesome, love the dahlias! Pretty shot! Love how you captured the Dahlias, so pretty. Oh, I'm just imagining what it would be like to have those dahlia fields to myself! Perfect focal point. Beautiful blooms! Very pretty flower that blooms for a long time! What an amazing sight that must have been. Love dahlias. That would be a glorious festival. Dahlias are just so pretty. Happy flowers and look delightful in the garden too!! Had it in my ancestral home in various colors and multiple petals!! Beautiful color! I love dahlias and we try to go every year out to the farm. PS: I love pioneer cemeteries also--have been to quite a few. Beautiful! I love the focus and the way you've framed this.